OXFORD – During fall camp, Zedrick Woods has impressed his defensive teammates with his eagerness to build on his learning experience from a season ago. According to Woods, himself, last season was a big help. During the 2015 season, Woods played behind Mike Hilton and Trae Elston, but that didn’t interfere with him getting comfortable with the defensive playbook and turning his knowledge into progression onto the football field. Woods played in all 13 games — starting two – last season, and recorded 25 tackles and one tackle for a loss of one yard. Woods is stepping into the forefront replacing Elston (a four-year starter at rover) and Hilton, who started at every position in the Ole Miss defensive backfield during his four-year career. With everyone gradually looking his way for production in the secondary, Woods is ready to step up and get the job done. 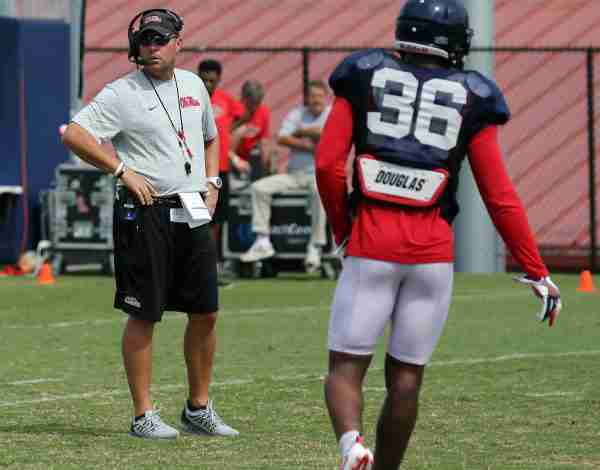 Senior defensive back Tony Conner and Rebels’ head coach Hugh Freeze have both praised Woods, a Lake City, Florida native. This year, he’s going to be a help in our secondary. He’s still kind of young, but as of right now, he’s in the film room each and every day learning the plays. I think he’s going to be a big help to our team. Freeze called Woods a “solid player” and said he is pleased with the adjustments he has made on the field with the young safeties. One of Woods’ strengths is communication, something Freeze has emphasized throughout the duration of fall camp. Anytime his teammates are out of place, Woods yells to the top of his lungs and directs them to the area they need to go. “I feel like we’ve gotten 100 percent better at it,” Woods said of the defense’s communication. Though the defense gave up some explosive plays during Sunday’s scrimmage, Woods is all in to make things right before No. 11 Ole Miss takes on fourth ranked Florida State on Labor Day in Orlando. Following Tuesday’s practice, Woods discussed the calls he and his teammates are making in the secondary. It’s us as a unit. Both safeties have to check. We just have to communicate and that’s really been a big emphasis. I feel like we’ve gotten better at it. I’m comfortable. I guess being on the field, learning the defense and him (safeties coach Corey Batoon) being on me about being more vocal. I’m just getting real comfortable. Everything is falling into place. Speaking of being comfortable, just how comfortable will Woods be when he steps onto the field against the Seminoles in his home state? Woods admitted he wasn’t part of the Florida State fan club growing up, so who was he a fan of?